Labor Day Sales are heating up, but, between newspaper inserts and the abundance of online options, it can be hard to find just what deals are best. But a number of sites are helping shoppers cut through the clutter to find the Labor Day sales that are truly best. The Huffington Post published a list of some of the best deals, which included sales at Kohl’s, Macy’s, and Best Buy. USA Today noted that car shoppers can find a number of Labor Day sales but need to be careful in looking. Some dealers — including Honda, Toyota, and General Motors — are using a “stair-step programs” that reward them for hitting certain sales goals that drive down the price of cars. But not all dealers are buying in. The nation’s largest auto chain, AutoNation, has opted not to use the stair-step program, which is said cuts into its profit margins. Other outlets are focusing on fashion deals. People magazine’s Style Watch section has clued readers in to some fashionable Labor Day Sales to check out. 25 percent off sale items at Nine West, which includes sandals, pumps, and boots starting at $22. 40 percent off sale items at Rachel Rachel Roy, a collection popular with StyleWatch editors. Up to 75 percent off at Reformation, and indie brand loved by celebrities like Zoë Kravitz, Miley Cyrus and Jennifer Lawrence. 15 percent off sale items at West Elm when you use the code LONGWKND at the checkout. 20 percent off everything at bkr, a minimalist brand loved by celebrities like Kristen Bell and Reese Witherspoon. 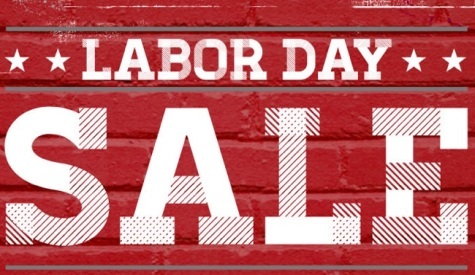 Labor Day sales actually offer some of the best shopping of the year. The blog Shop Time conducted an analysis of sales from different points throughout the year and found that in 2011, Labor Day sales offered an average of 48 percent of clothing, shoes, and accessories. That was better than the average discounts an either Black Friday or Cyber Monday.